Hi, everyone. I’m not in Scotland right now, but in Chicago, signing books at the International Quilt Festival, where about 60,000 people have gathered. Quite a few will stop by to see me, Marie Bostwick, and Arlene Sachitano to pick up a couple of books. I feel very fortunate to have this opportunity to meet with my readers and make new friends. I’ve always loved Scoltand—from the tartans to the bagpipes. When I was a child, though I wasn’t Catholic, I dreamed of going to Catholic school because the girls wore plaid uniforms to school (at least my grandmother’s neighbor’s daughter did!) I guess loving Scotland is in my blood, as my ancestry is part Scot. Some days while I’m writing, I swear I can hear bagpipes, but it’s probably just wishful thinking. 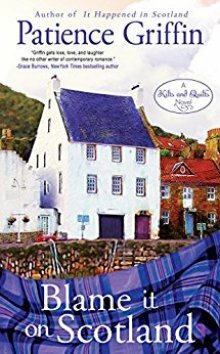 In the Kilts and Quilts series, I write about the fishing village of Gandiegow, and now, the wool community of Whussendale. Fun fact: I came up with Whussendale when I was perusing a Scottish dictionary and stumbled across the word Whussenday. I loved the sound of Whussenday, and voilà, Whussendale was born. And for those of you who haven’t read the Kilts and Quilts novels, Gandiegow means a squall of wind and rain. But Gandiegow isn’t Crail. Gandiegow is comprised of many of my favorite villages. I once visited Crovie (pronounced “criv-ee”), which is on the northeast coast of Scotland between Pennan (Parts of Local Hero (https://amzn.to/2J58th4) was shot there) and Banff. The landscape of Crovie resembles Gandiegow, but not the village itself, as most of the cottages in Crovie have been converted into holiday lets. A few years ago, I met a Scottish quilter at QuiltWeek in Paducah and when I visited Scotland the next year, I met up with her and her husband. She took me to Footdee (pronounced “fit-ee”, https://en.wikipedia.org/wiki/Footdee) Okay, so we had to hop over a cement wall to get there from the beach. Yes, I was glad there were no video cameras running. Two fifty something women going over the wall would’ve made America’s Funniest Videos for sure! Footdee, an ancient fishing village, was magical. A time-capsule almost. There was an artist, though she was closing down for the night, invited us in to see her paintings. The fisherman’s cottage which housed her gallery was once her grandfather’s cottage. I bought several of her greeting cards and have framed them for my Scotland wall in my office. So here’s the thing about travel and the most wonderful thing about books. You don’t have to leave your home, deal with getting patted down by security at the airport, or have the expense of travel. Books make it easy to travel anyway, but I choose Scotland. For me, the added bonus, is that even if I’m sitting at my computer at home, my heart is always there in the Highlands…either in Gandiegow or Whussendale. Or other places my characters may travel. It’s the magic of books. Question: Where in the world would you love to travel in in books? Please leave your recommendation below so the rest of us can read about other countries and other cultures.